Have you always wanted a successful creative business but struggled with building a website, email marketing, online advertising or growing your following on social media? That’s why we’ve created the Studioworks Creative Business Academy! Through our creative business classes, we’ve helped thousands of fellow creatives nurture and grow their online business. Now, is the time for us to share what has worked for us - in the hope that you too, can grow your creative business and begin to discover the joy of being an artistic entrepreneur! If your goal is to sell your art, teach or just reach the audience you desire, this community is for you! We want to empower you to create a life around your passions and help you create a vibrant creative business. If no one knows about your gifts, no one can benefit from them. It’s time to shine your light! We’ve put together the best lessons and strategies we’ve learned into a step-by-step system to help you create a successful creative business. The Studioworks Creative Business Academy is an online community of like minded creatives wanting to grow their business and share their passions with the world. When you join us inside Studioworks, you’ll gain access to everything you need to begin, grow and create a successful creative business. We provide access to step-by-step training, easy to follow lessons and share everything that we’ve learned during our 20 years of running a successful creative business. Best of all, you’ll be supported by not just us. but also the amazing Studioworks community! We truly believe in helping others unlock their creativity and empowering them to share their gifts with the world. EXCLUSIVE CONTENT • NEW LESSONS EVERY MONTH • AND SO MUCH MORE! What’s included in Studioworks Business Academy? The Studioworks Creative Business Academy offers FULL access and the support you need to guide you step-by-step to creating a successful creative business. Whether you wish to sell your artwork, teach online or simply share your passions we've got you covered! We’ll be here for you every step of the way. Ask us anything about creativity and business from overcoming doubt to designing your brand! We love chatting with our students and connecting with like-minded creative entrepreneurs! “I cannot thank you enough! Studioworks is hands down the best learning about online marketing I have ever had! So grateful for your expertise and all that was shared. The internet is so huge and daunting and impersonal, your videos brought clarity, balance and were personable. Truly grateful! Creating a beautiful brand is essential to a successful business and relating to your audience. We’ll show you the design tools and strategies to create a successful brand you can be proud of. A website is YOUR front door to success and abundance. It provides the platform to reach the audience you desire and share the gifts that only YOU have! We’ll walk you step-by-step along your journey to launching a beautiful website. Content creation and sharing on social networks is key to any creative business’ success. We'll show you how to set up your blog and create the right content to share with your audience. It’s easier than you think! Having trouble selling online? It can be difficult if you don’t truly understand your audience. We’ll help you unlock your unique gifts and connect with a dedicated and loyal audience. We’ll show you how to identify your ideal customer and build the right strategies to communicate with them. Facebook? Instagram? Pinterest? YouTube? What’s the difference and how can you succeed on social media? It can seem overwhelming to choose the right social networks to focus on. We’ll explore tips on finding where your tribe is and how to relate to them effectively on popular social platforms. Once you’ve found your audience, it’s time to begin growing your relationship with them. How can you best serve them? We’ll show you how to curate the right content, ways to authentically connect with your following and how to implement marketing strategies that help increase your presence. Marketing is (when done artfully and authentically) simply a form of storytelling. It's a way for you to share your story, your gifts and yes, prosper from them. 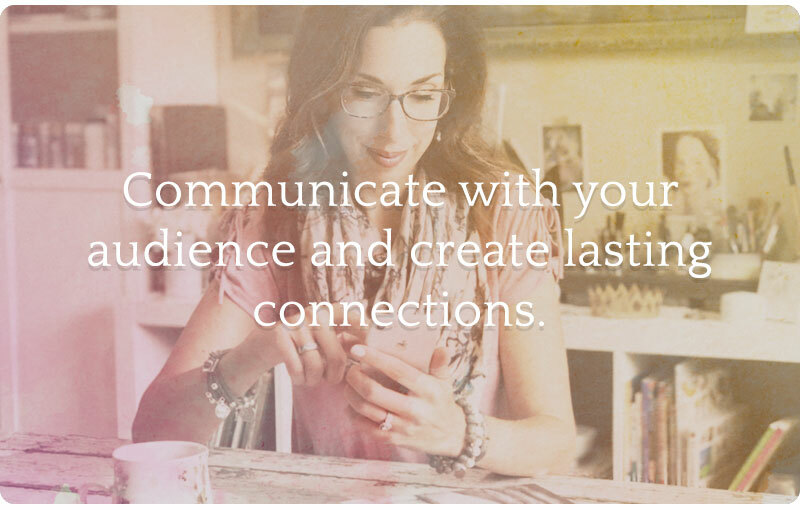 We’ll show you how to connect with your audience in ways that feel authentic, effective, and leads to your most loyal fans and customers. We’ll share with you how to attract new followers and design beautiful email marketing campaigns that are sure to engage your audience and nurture your relationship with them. Have you been wanting to learn how to film your own Art videos but it all just seems overwhelming? We totally get it! We’ll show you how to start with very little cost (hint, if you have a phone, you’re ready!). We’ll explore not only the tools and tips of how to make an art video but how to get the best YOU across to your audience. Do you struggle with growing your following, getting your message to the right people or wonder how to find new audiences to purchase your products and services? Creating effective Facebook ads (when done correctly) can have amazing results – FAST. We’ll share with you our strategies that have helped us find and grow new followers and increased sales. It’s not as hard (or expensive) as you might think and it can be a lot of fun once you see how effective these strategies work. With over a 100+ videos, resources and a supportive creative community. We’ve created everything you need to begin your journey to creating a successful creative business online. Plus, there are some bonuses! Looking to stand out from the crowd? Creating a strong brand is important and we’ll share the design and typography fundamentals to creating a brand you can be proud of. If you’re posting, blogging and sending email daily, weekly or monthly, it can seem a little overwhelming. Not to worry! We have a useful scheduling tool to keep it all organized. It's a lifesaver and keeps us organized on a monthly basis. If you want to know how to capture email addresses and what to do with them, this is the place! We’ll show you how to set-up your Google and email marketing accounts and how to begin tracking subscribers, orders and so much more! We provide you with a helpful checklist to manage your email, social and blog. These handy lists keep you organized and ready to launch your content marketing! Buying online classes adds up, right? Well, with the Studioworks membership you get it ALL for only $39 a month! This is an incredible value! With our current selection of business and creative classes, this comes to an amazing $3,200+ worth of content! You get access to EVERYTHING for just $39/month PLUS access to all our NEW and upcoming business and creative classes! Your library of classes will continue to grow while your monthly price stays the same! Woo! Grow your creative business on all of your favorite devices. Watch at home on your laptop, desktop or learn on the go. + Q: What is the StudioWorks Creative Business Membership? The Studioworks Creative Business Membership is an online subscription that makes it easy to have full access to over 100 creative business videos, all of our creative classes, new classes added every month, a supportive community, live Q & A and so much more! Plus you'll get exclusive content and discounts delivered straight to you! It's everything you need to create, build and grow a successful creative business. + Q: What do I get as a Studioworks Member? Your Studioworks Creative Business membership is loaded with perks and benefits including, over 100 creative business videos, the Studioworks Creative Business Plan, weekly email support, a monthly issue of the Studioworks Journal, new classes every month, exclusive discounts, live Q & A's, monthly lessons, and so much more! Plus, you'll have 24/7 access to your classroom, which means, you can take your creativity with you wherever you go, whenever you want! + Q: What if I want to cancel my membership? If you decide the Studioworks Membership isn’t for you, you can cancel anytime by contacting us at support@ivynewport.com. Canceling the Membership prevents your payment method from being charged in any future month. For instance, if you cancel anytime in January, you will not be charged in February. You’ll continue to be able to access and benefit from the Membership through the last day of the month in which you cancel. You will no longer have access to the Studioworks Creative Academy portal. If you purchased any previous or future classes, you will still have access to them through our Ivy Newport classroom portal. + Q: Is the Studioworks Creative Business Membership for me? Have you always wanted to know how to run a successful creative business online, but struggled with where to begin? We've created a community where you can learn the latest strategies to help you grow your business, access your classes anytime and reach out with questions when you need us. Inside the Studioworks Creative Business Academy we cover everything you need to find and grow your audience, create your own website, email marketing, online adverstising and so much more! + Q: How are the Studioworks Creative Business classes Journal delivered? Everything is in your custom online Studioworks Membership portal! Simply log in and access the Studioworks Creative Business Plan, , all the classes, lessons, resources, the Studioworks Journal, Q & A's and more! You can access the Membership portal from your computer, tablet or smartphone. Plus you can join our private Facebook group to connect with other creative business owners, ask questions, share your journey and have fun! This amazing community will support you on your creative business journey. + Q: How much of my time will it require each month?